The third day of the Co-op Hop was a favorite, chiefly because it was so quintessentially Minnesotan. After having been plugged in at my Roseau hotel overnight (14 hours at 120v gave me back about 76 miles, so I had a "tank" of 179 miles), I wanted to pop over to the Sven and Ole's Ultimate Carwash to shine up the Bolt before showing it off at Roseau Electric Cooperative. After I made my way through the touchless wash, an attendant greeted me as I took photos near the exit. I mean, you can't get more Minnesotan than a Sven and Ole car wash with THIS as the countdown sign. He, bless his heart, wanted to make sure the wash worked okay for me, and then asked several questions about the car. We had a great chat about my trip and where I was able to charge, and then I was off to Roseau Electric. I timed my stop at the co-op perfectly, right before the board was gathering for its monthly meeting. I got the whole gang to come out -- my biggest group yet -- and racked up a hop high of six test drives. They all really wanted to get behind the wheel! The board members and employees had a lot of great questions about home charger costs (about $500-$1,500, or less with a cooperative rebate), the size of the battery (60 kWh), and when they would see an all-electric Ford pickup (the hybrids are in development, so it may only be a matter of time). These hardy Minnesotans love their pickups. 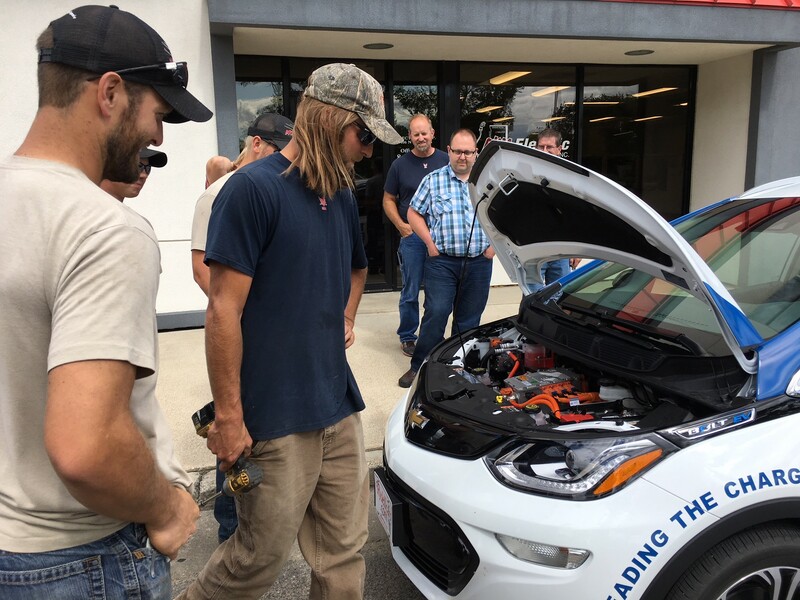 The Roseau Electric group all wanted test drives, but were also curious about what was happening under the hood to create all that power. Look at all those smiling faces! After this photo op, it was back to the boardroom to make the big decisions on how to best serve their members. After all those test drives, the board had to get back to its meeting, and I left Roseau with 165 anticipated miles of charge. I was right on target, but knew I would have to stop in Thief River Falls, Minn., for a top-off charge. I had called ahead to Westside Motors a few weeks back to ask permission to use their Level 2 charger for a couple of hours, and general manager Tami was kind enough to say yes. And this is where the Minnesota nice gets even nicer. I plugged in the car to the outdoor charger and then asked Tami and her colleague Matthew for the number for a taxi so I could scoot off to a coffee shop for lunch and to catch up on work. They wouldn't let me take a taxi. Matt was going to drive me there himself, and someone would come pick me up when I was ready. As I charged at Westside Motors, I was parked next to a Dodge Charger R/T with a Hemi. Who would win in a race? Probably the Bolt, which can get from zero to 60 in less than seven seconds. After two hours of plug-in time and 55 miles added to my charge, I was off to Red Lake Electric Cooperative in Red Lake Falls, Minn. I finally encountered the first rainfall of my trip, but it was just a light drizzle that lasted five minutes. It was nothing to hinder my travels. I was able to talk to a great mix of office employees, linemen and board members at Red Lake, and I racked up a few more test drives. I love letting people drive the Bolt, because the face they make when they really step on the gas for the first time is absolutely unbeatable, especially for those who buckle in as nonbelievers. The linemen always have the best reactions. I've seen a few people become believers along the way, and there are more to come. Even those rural line workers who are partial to their combustion engine vehicles begin to think a little differently once they feel how smooth an EV can be. Another co-op, another great hour of electrifying conversation. 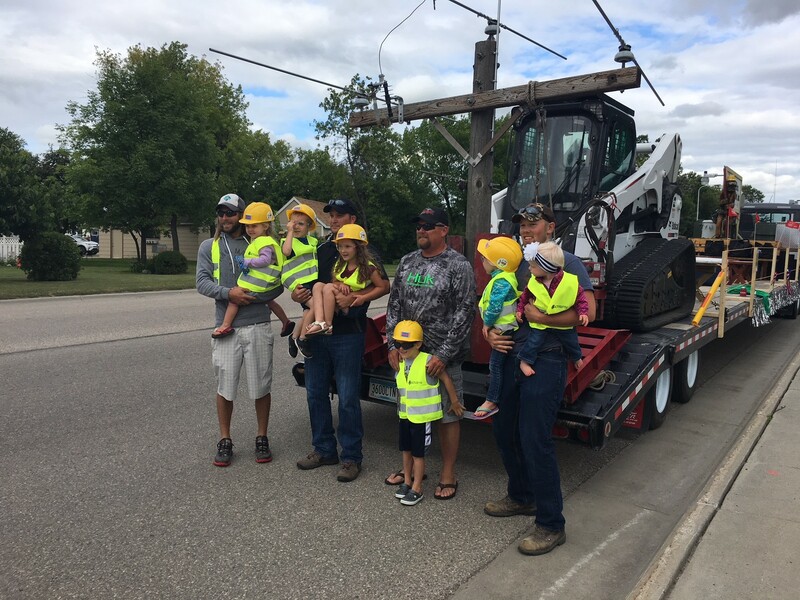 Thanks, Red Lake Electric! 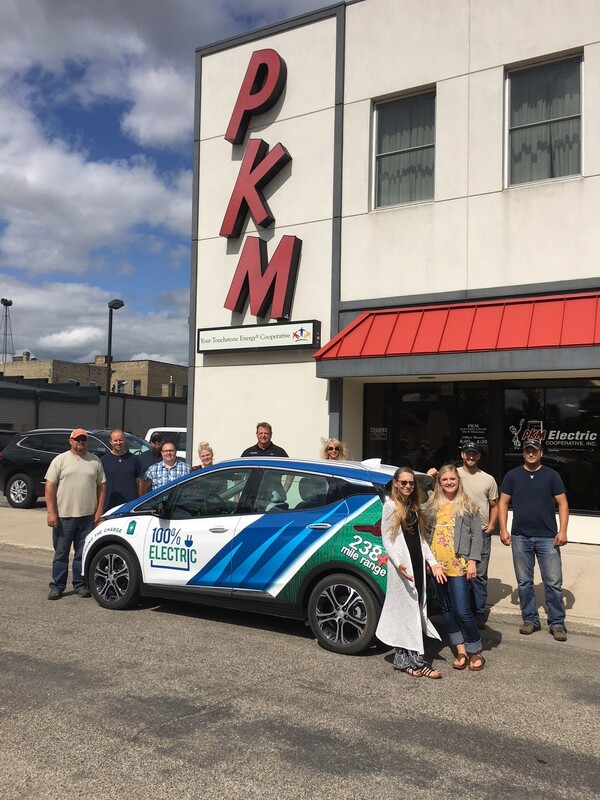 My next stop on the hop was Warren, Minn., to visit the fine folks at PKM Electric Cooperative and join them in the Kick-off Parade of the Marshall County Fair. Yes! Another parade! 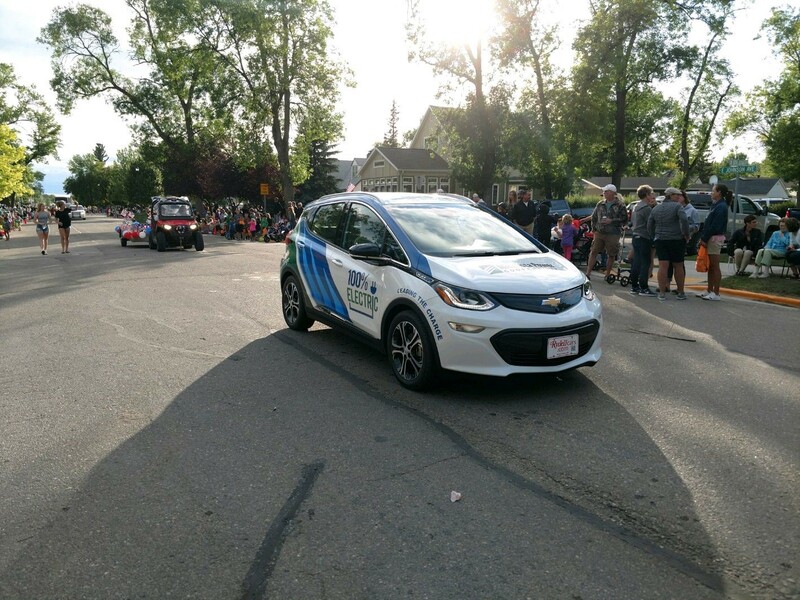 The office was buzzing about the electric car parked out front, and one PKM board member even called in to see if he could come over for a drive before the parade. The answer, of course, was of course. I again had a lot of people who wanted to see what was happening under the hood and in the cargo area, and everyone was amazed by how quiet and how roomy the Bolt was. I'm learning that many people don't realize that electric vehicles are just as comfortable as any other car on the road. That realization may get more of them on road. I had the chance to answer some insightful electric vehicle questions before the parade. And don't worry. He didn't use the power drill on the EV. I protect this Bolt like my baby. I want to brag about this group a little. They had such fun personalities and I felt right at home prepping for the parade with them. I'll bring the Bolt back any time, team! The time to line up for the parade rolled around and I saw just how fun this small-town community is. There seemed to be about 200 entries in the parade, with everything from street-ready snowmobiles to a man on a unicycle. PKM's float was one of my favorites, though, with a simulated power line and PKM children outfitted in safety hats, vests and glasses. My heart melted. 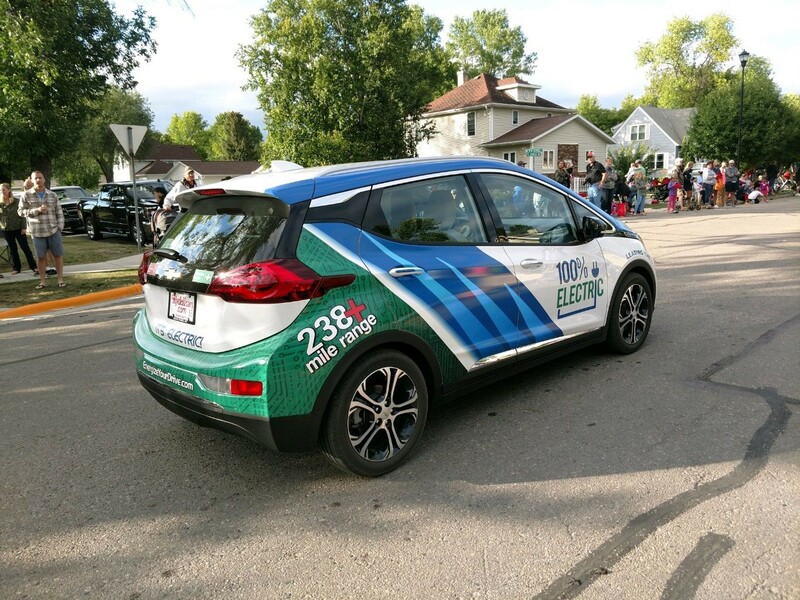 Over the course of the parade, the Bolt didn't lose a single mile of charge between the slow speed and regenerative braking, much like what I experienced at the Roseau County Parade. And all the candy-crazed kids and laughing families kept me charged up as well, even with all of the miles traveled over three days. Again...this was the Minnesota I love. These cuties were such good sports along the parade route, even in the chilly wind. The M&Ms and Almond Joys probably helped. Thousands of people lined the parade route to the fairgrounds. This was my second parade in two weeks, so I had my parade wave perfected. I arrived at the Minnkota fleet garage with just 43 anticipated miles left of charge, which was actually more than I was expecting. The weather and charging stops had all been working in my favor, which I know won't always be the case when driving an EV. Now it was time for a full overnight charge before hitting the road again in the morning. Six hundred and thirty-two miles down, and a couple hundred left to go. Bring it on, Co-op Hop Day Four!